This FLIP7 3-Filter Kit with MacroMate Mini +15 Lens from Backscatter includes the FLIP7 dual-filter flip frame, a SHALLOW filter for depths between 5 and 20', a DIVE filter for depths between 20 and 50', a DEEP filter for depths over 50', a MacroMate Mini +15 macro lens, and a 55mm lens adapter. It's compatible with the GoPro HERO3, 3+, 4, 5, 6, and 7, and it can be attached to the camera's Standard Housing, Dive Housing, or Super Suit Dive Housing. The FLIP7 system is made of durable aluminum, and mounts onto the housing by easy clamp-on attachment. 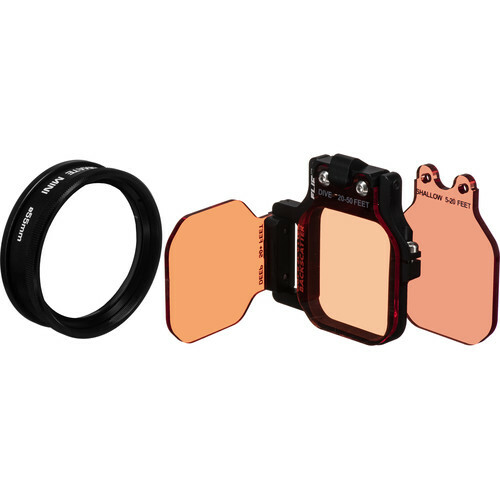 The FLIP7 system supports two filters or one filter and one lens at a time, allowing you to quickly switch between filters using a finger to flip the mounted filters up, down, or to the side. The circular MacroMate Mini lens allows for a 3" close-up underwater focusing distance, allowing you to get as close as possible to your subject. It works in the GoPro's wide, medium, and narrow video modes. The lens features a 55mm threaded filter holder adapter to add circular filters to the lens such as ND, circular polarizers, or additional close-up lenses. Also included with the kit are a port adapter for the HERO5/6/7 Super Suit, a port adapter for the HERO3/3+/4 Stock Housing, a neoprene wallet to protect the filters and MacroMate Mini lens, a HERO5/6/7 lens removal tool, and Allen wrenches to install the kit. Box Dimensions (LxWxH) 8.5 x 5.3 x 2.3"